That portion of Otonabee township bordering on Rice Lake and the mouth of the Otonabee River, through the recent discoveries of Mr. David Boyle, curator of the archaeological museum, Toronto, has proved to have been the home of the mound builders in Ontario. 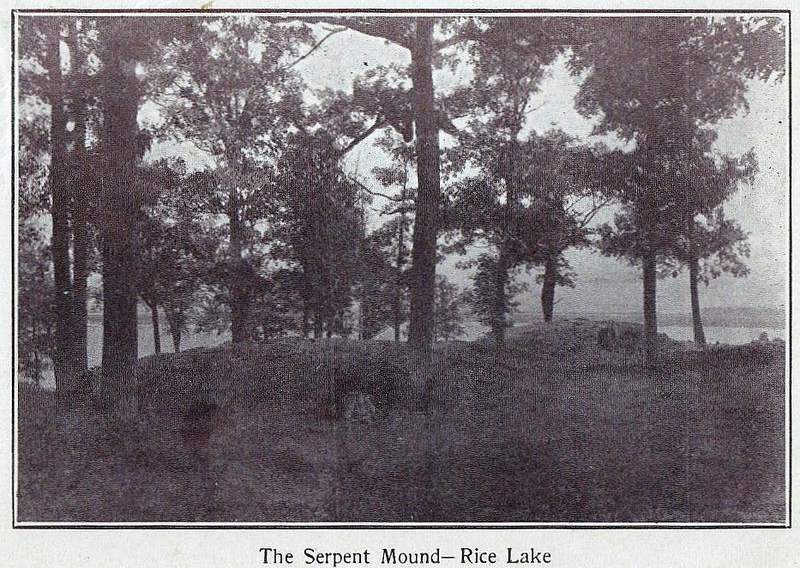 Last week - a week ago today – the discovery of a serpent and egg mound, on Roche’s Point, two miles from Keene, was announced and since that time Mr. Boyle has been engaged examining other portions of the land adjacent to the lake and river and has made some interesting discoveries. The dark-faced brethren engaging in farming principally on a reserve set a part by the Government. The farm which Mr. spears occupies is at the mouth of the river, west of Hatrick’s Point, the popular summer resort on the Otonabee. The farm is of an historical nature. It was originally the property of an old British officer, Capt. Anderson, or Major Anderson, who was given a grant of 2,000 acres by the British Government. Very few of the residents of the locality are aware that on the east end of the farm, within a few feet of the lake can be discerned the ruins of an old Northwest trading post. In fact, only one person, Squire Thompson, could be found who could recollect the time when the walls of the house were standing. It was known as the old Bay House and was used for traders coming from the Huron country, now the populous counties surrounding the Georgian Bay, to dispose of their furs at Montreal. The post was possibly more of a resting place where sleep and fresh stock and provisions could be obtained than a trading post, Mr. Boyle learned from Mr. Thompson that the building, which was built of logs, faced the east and west and the chimney stood at the east side, where the only remains, likely those of the fireplace, can be seen. The dimensions of the structure were probably 20 by 24 feet. It is some 25 years since the walls were last seen standing. The post was situated close to a good landing place directly opposite Spook Island. The red seems to be half burnt sandy clay. The greatest depth reached at this spot was five feet. The field, in which the mound was situated, looks as if it was an old village or camping site, as the land is burnt to a great extent. Mr. Boyle finds a noticeable absence of pipes in this locality and evidently these Indians were not a smoking race. At Nottowassagga, in the country of Simcoe, more pipes than anything else were found. Mr. Boyle procured an unfinished stone pipe from a Hiawatha Indian and a soapstone pipe for Mr. J. McIntyre. The former was similar to those found in the mounds of Ohio. Mr. Boyle went to Toronto this morning, but will return and spend some time in Otonabee.